Sampling at the first station. 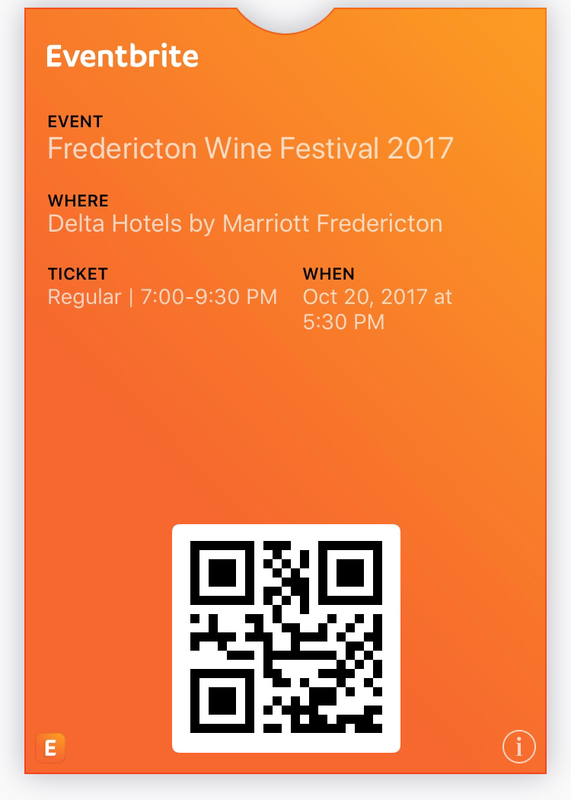 On Friday night I participated in my first wine sampling, called Wine Fest. 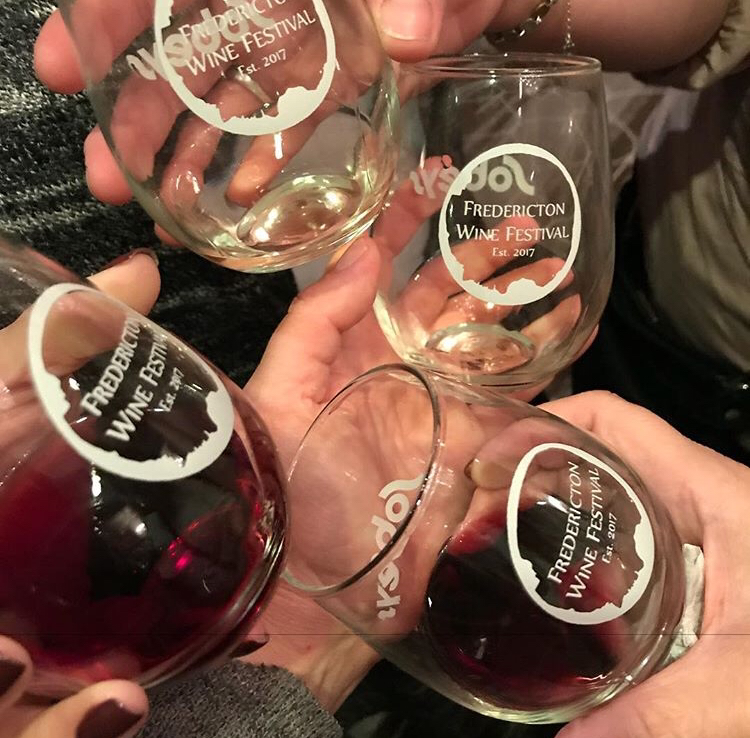 It was a wonderful evening that featured local wineries and cider houses. 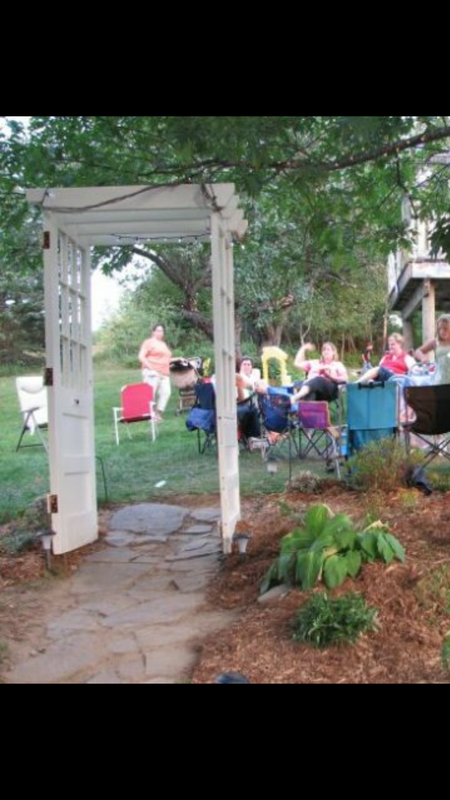 New Brunswick is blessed with a bounty of gifted winemakers. 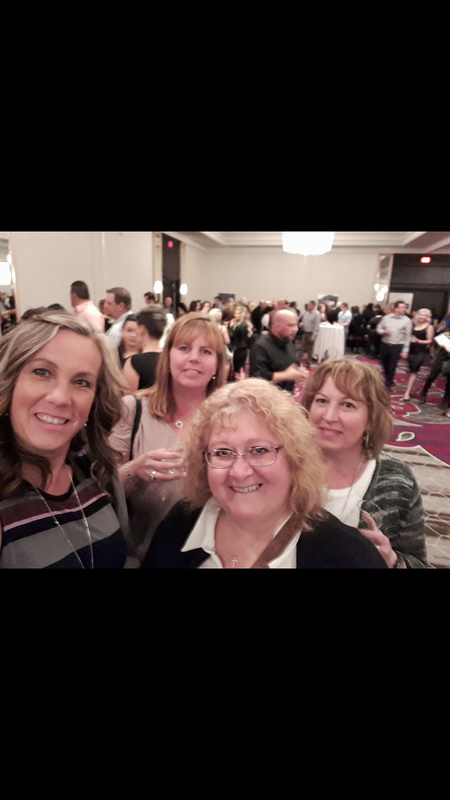 A fun evening with the girls. We discovered some new favorites. And oh the nibbles were awesome! Sobeys featured an array of cheese samples and the Delta served beautiful canapés. It was a terrific night. We plan on making the event an annual tradition. As usual our girls’ night left me with a sore jaw and ribs for laughing so hard. I am blessed to have such fantastic women in my life. Trellis for my bittersweet to climb created from two old doors and some rebar. Love it. I love to go to auctions, flea markets, and yard sales. I also adore curbside finds. The challenge of creating new life from “old junk” gives me a thrill every time. I feel that these reloved and repurposed items are what give my home some soul. I have found that architectural salvage items are so useful as a creative option. Some people look at an old solid wood door, and they see a door. I see potential. 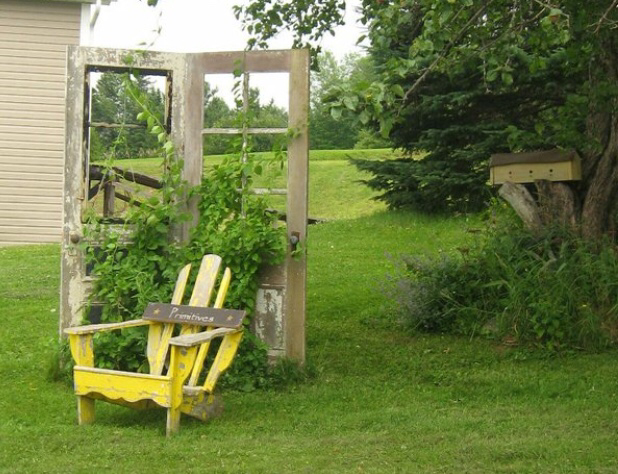 I have reused them as trellis and arch ways in my gardens. They are also lovely when cut down for side tables and even tabletops. Arch way my hubby built me using two old doors from my grandparents homestead. I love to use old stuff as storage. 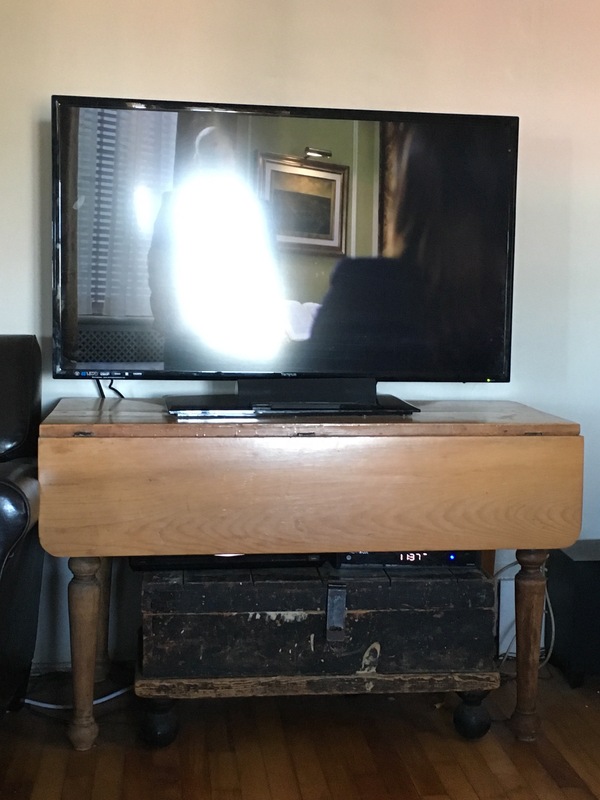 I use a time worn tool box as a stand for our media boxes under my Nanny’s pine table. It holds a ton of dvds and other odds and ends. I also repurposed an old laundry washstand into a coffee table for our living room. I do not only collect enamelware, but I use it throughout our home as storage. It looks great and keeps things like face clothes from taking over in our old farmhouse. It is all in how you look at it. 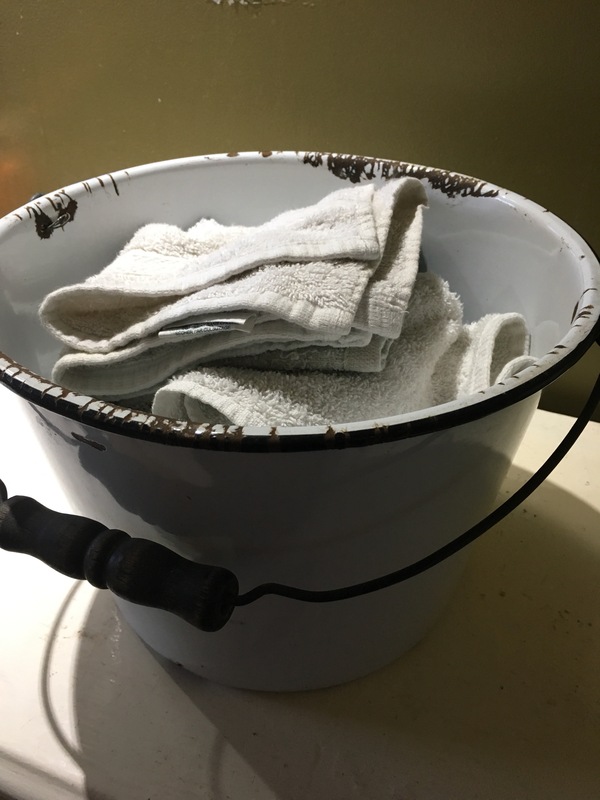 An old enamelled chamber pot, works great as a clothespin bucket by my back door. An enamelled pail corrals my face clothes in the washroom, and looks good doing it. 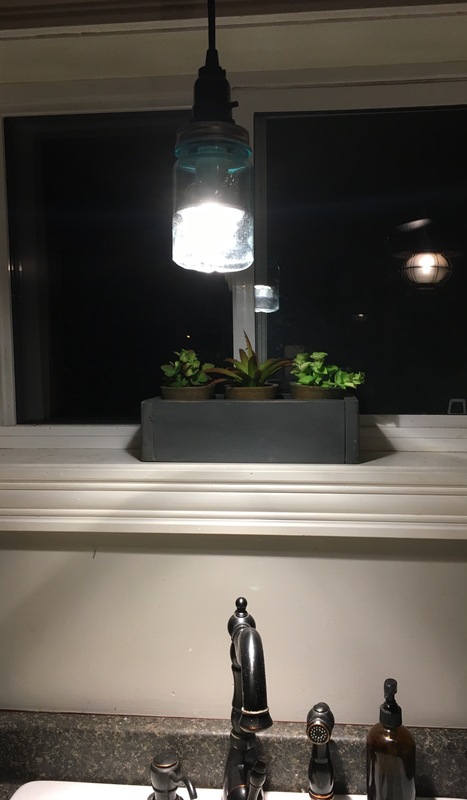 I needed a new light for over my sink, so I made one using an old broken mason jar and a lamp kit. It is pretty and unique. So the next time you are out and come across some old stuff, look closer at the treasure that could be. A broken mason jar makes a terrific farmhouse style light. I have a 27 lb turkey in the oven roasting nicely. 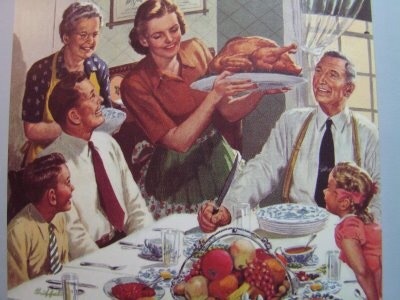 Bob, as we dubbed him, is our guest of honour for today’s Thanksgiving feast. Even with the teenagers we will have leftovers. Yippee! I happen to love using up turkey, but not everyone is a huge fan. Here are my families favorites. My kids love this! 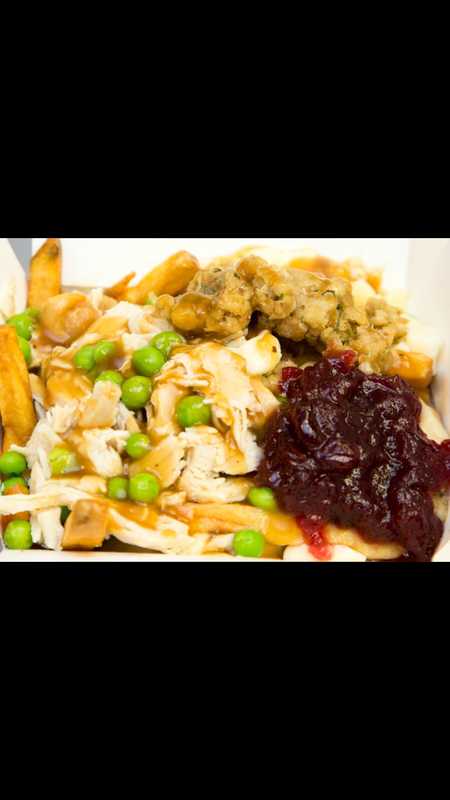 Fries, dressing, turkey, peas, cheese curds and turkey gravy. The cranberry sauce is optional. 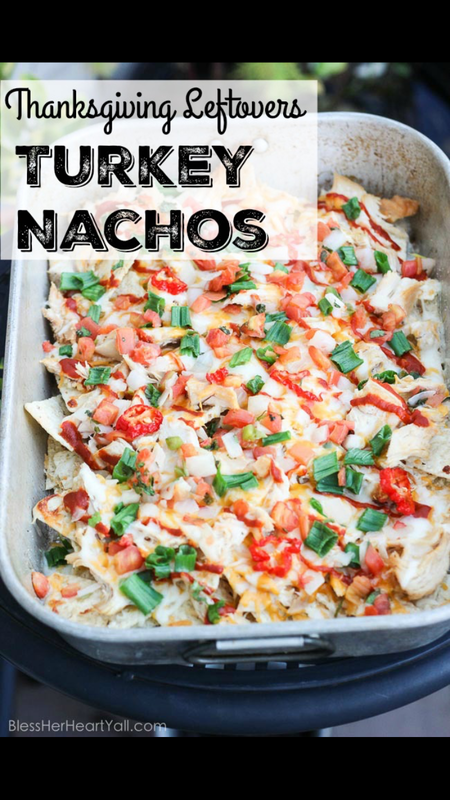 I found this recipe last year at Blessherheartyall.com. Huge crowd pleaser. Just Freeze It. Turkey freezes really well and it is great to have some on hand ready to go if you need sandwich or wrap fixings on the fly. 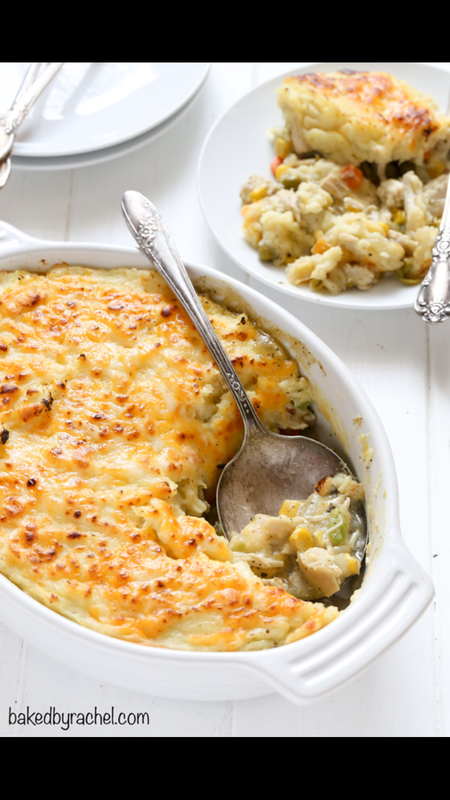 Just dump it in a casserole dish, top with potatoes and grated cheese, and supper is ready. Who are your favourite bloggers/ sources of inspiration? 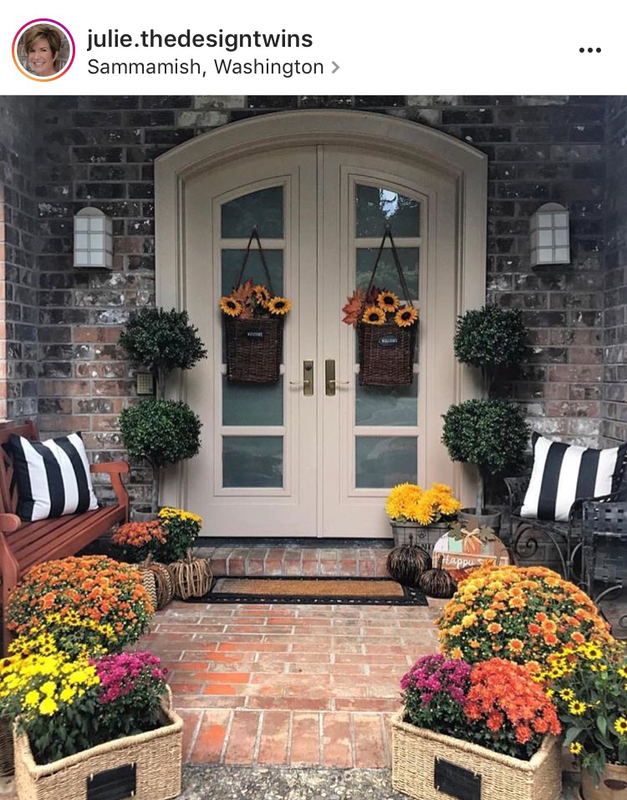 I have been enthralled by all the beautiful Autumn posts. There are such fantastically talented people out there. It just makes me want to paint, bake, and decorate everything. Holy Pumpkin Spice! Warmest of Welcomes. Julie.thedesigntwins created a gorgeous, symmetrical entry that is bold and graphic. The warm hues of all the flowers call out welcome to all who enter. I would love to grab a pumpkin spice latte and enjoy a book, nestled into the comfy seating offered. 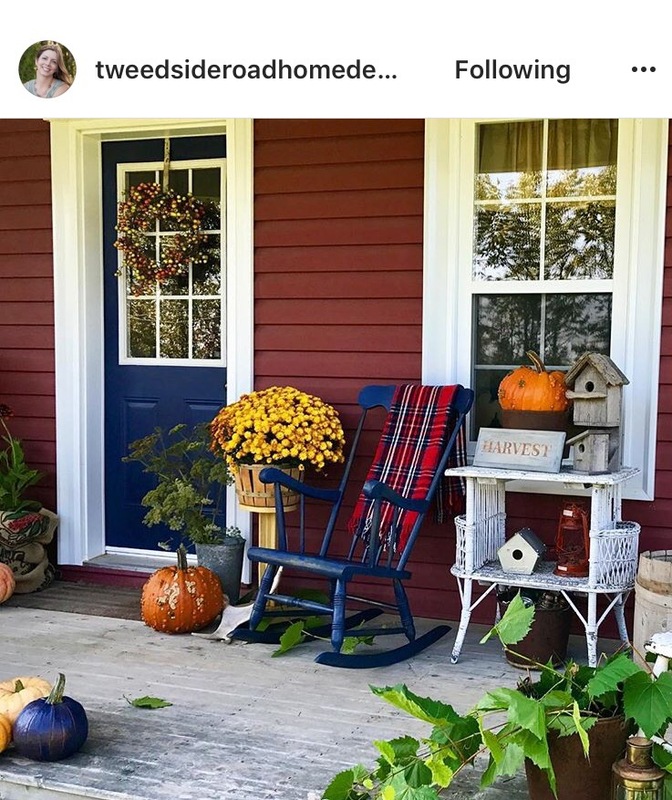 Check out her home tour here. Tantalizing Tablescapes. I love everything about this dining room by antiquefarmhouse. 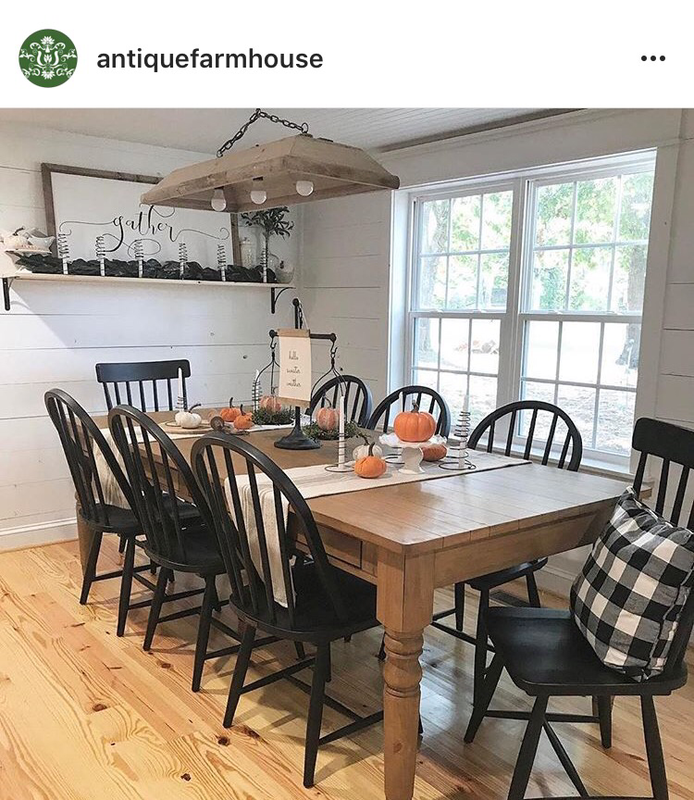 Swoon worthy lighting, ship lap, gorgeous farmhouse table, and the perfect decorating touches made this post catch my eye. This is my style of decorating, I call it eclectic farmhouse. Gather here To check out the original post. Coffee Bar. 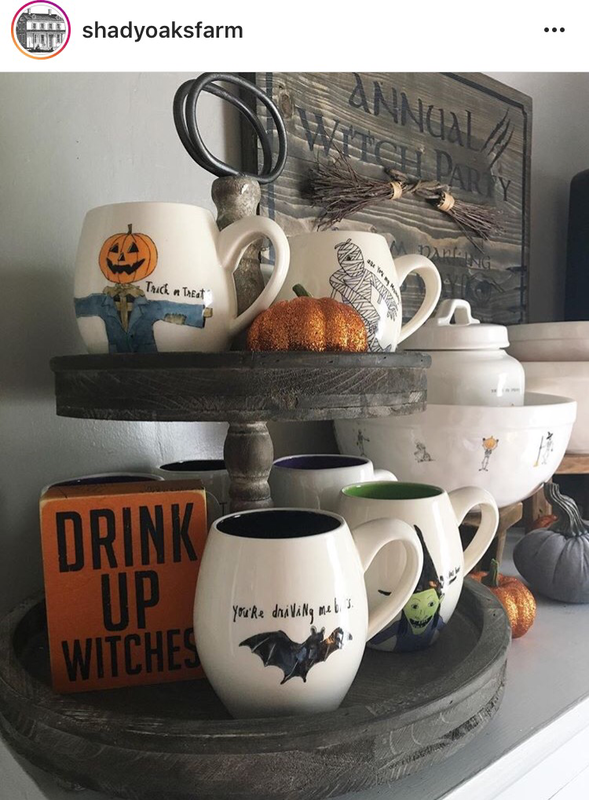 This Halloween inspired take on the ever popular coffee station is cheeky and and festive. 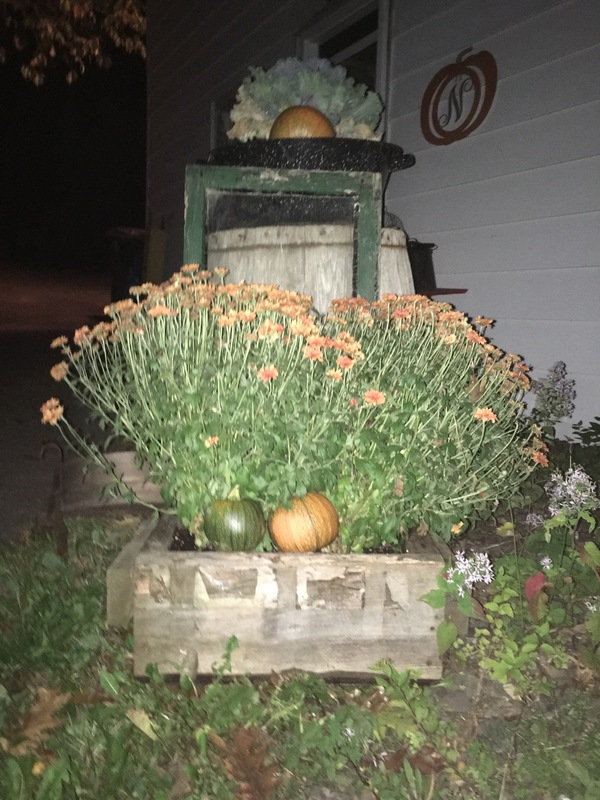 With the little pumpkins tucked in, this tableau is as attractive as it is functional. Shadyoaksfarm nailed it. Navy State of Mind. 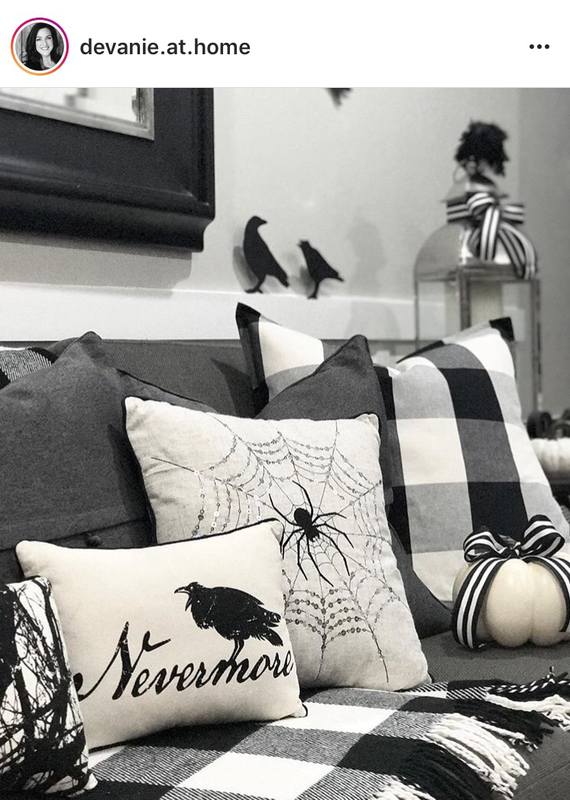 This cozy display by Krista at Tweedsideroadhomedecor Just makes me want to sit for a spell and relax. The navy rocker is the perfect perch to sit and enjoy a glass of wine after a long day. Let me know who some of your autumn inspirations have come from. We love our old farmhouse. It is overflowing with charm, and we have made a lot of memories here with our family. 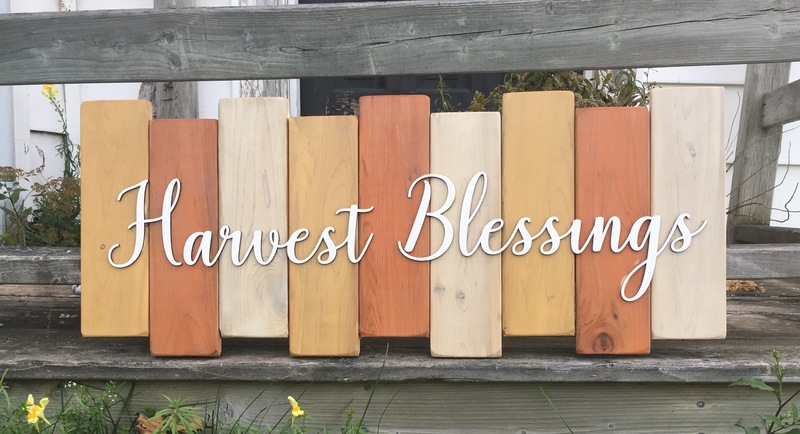 With the charm comes a tonne of work to get ready for the upcoming winter months in our Canadian climate. 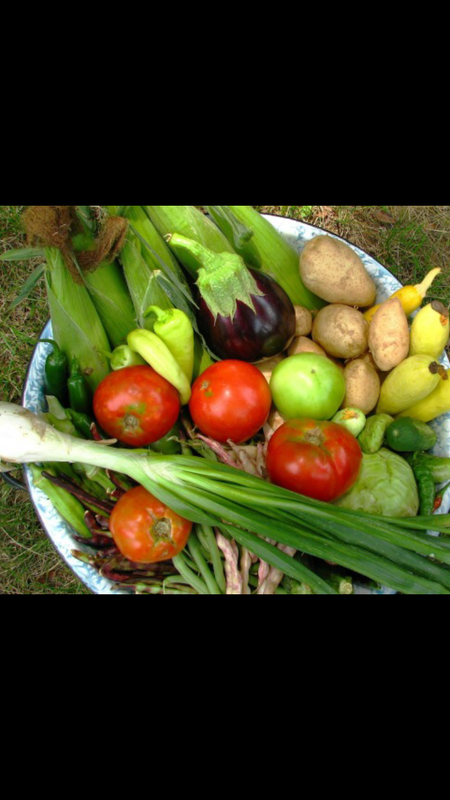 First, we harvest our garden. All veggies left are picked and stored in our rock wall basement. It make for a wonderful veggie storage solution. This summer’s drought like conditions meant that there was less to pick than typical years. Our yields were certainly down this year. The wood house is filled to the brim. Next, is the firewood. 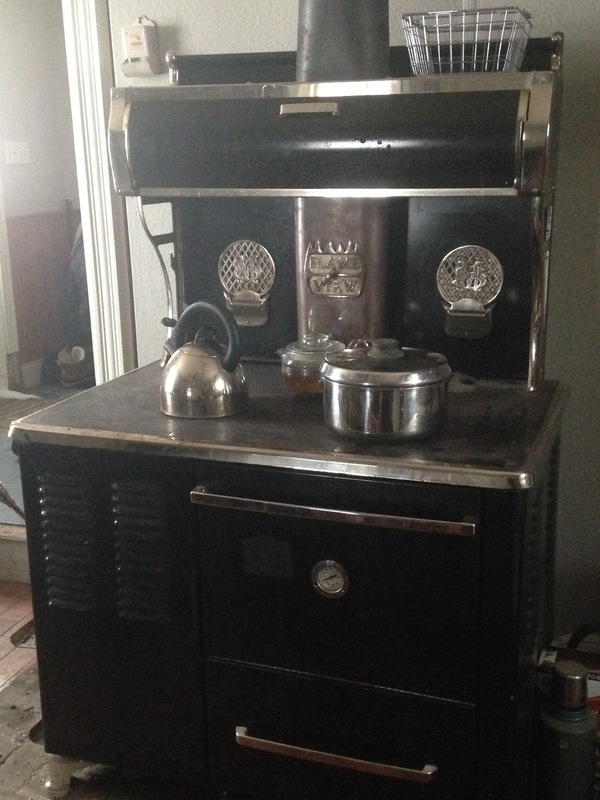 We use an Amish built wood cook stove as our primary heat source. (I also do 90% of our cooking and baking with it through the colder Canadian months.) This makes our kitchen the room that all friends and family tend to gather in. 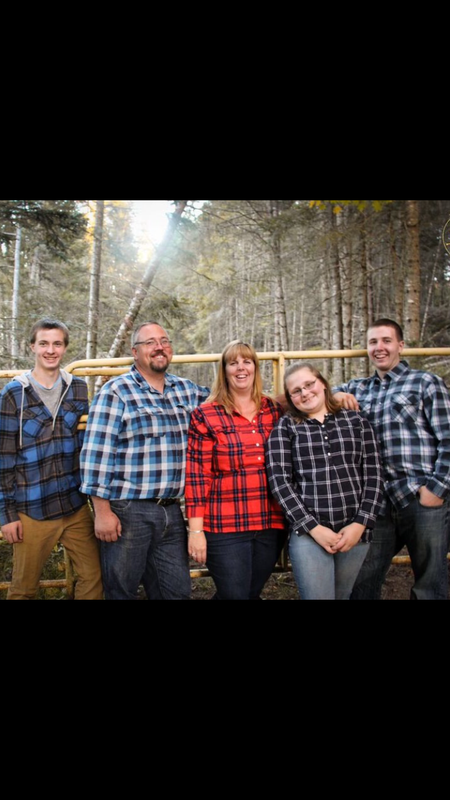 Our family puts in 5 cord of wood each year. This means we also get to cut, split, and rank 5 cord each fall for the next year. We like to season our firewood for a year if possible. My hubby also gives the flu a good cleaning and inspection to get ready for safe use. I am terrified of flu fires. So this is a definite must. 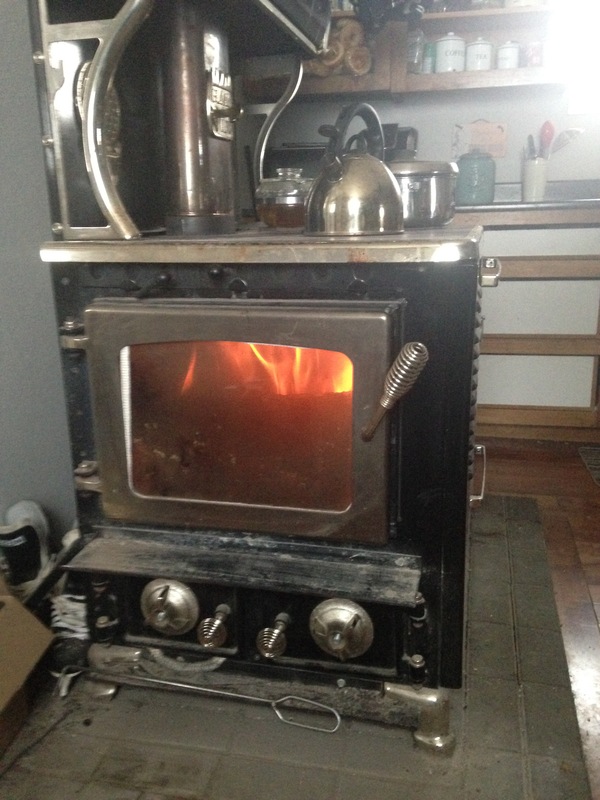 Our wood cook stove when we first installed it. 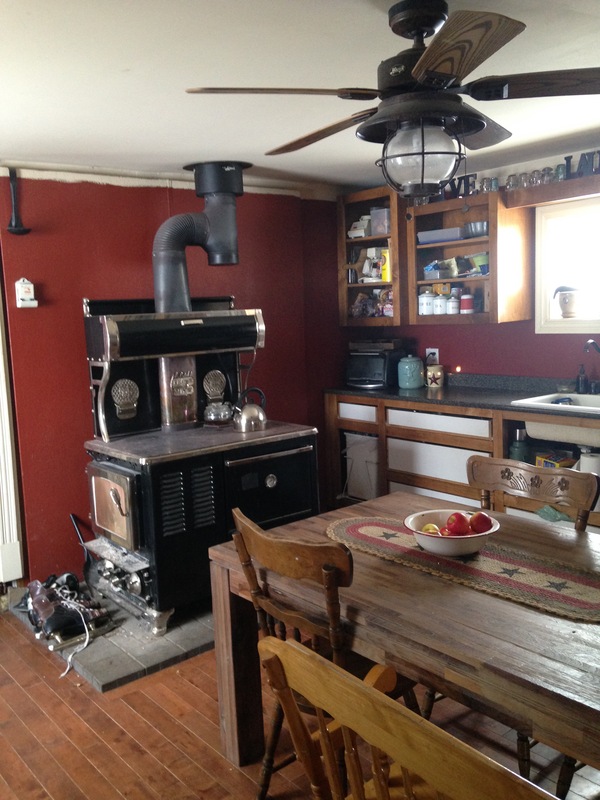 My kitchen is no longer this cozy barn red color. Looking at this pic I really miss the red. Different view of our stove with our present color, Revere Pewter by Benjamin Moore. My favourite view. I curl up beside the stove after supper most evening to enjoy my cup of tea. Finally, I clean out all my flower gardens, and often divide and give away plant slips. 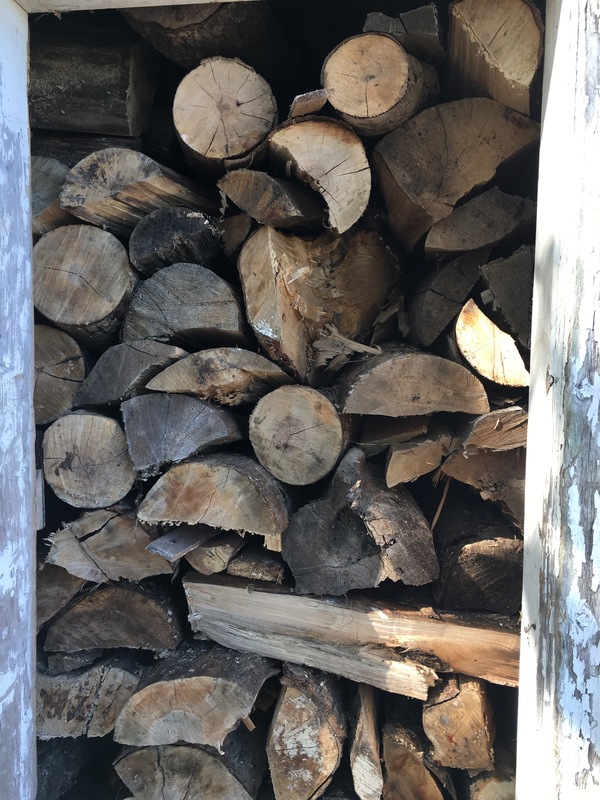 To keep it real, I will admit that sometimes this chore does not happen until the spring if the weather changes too quickly. 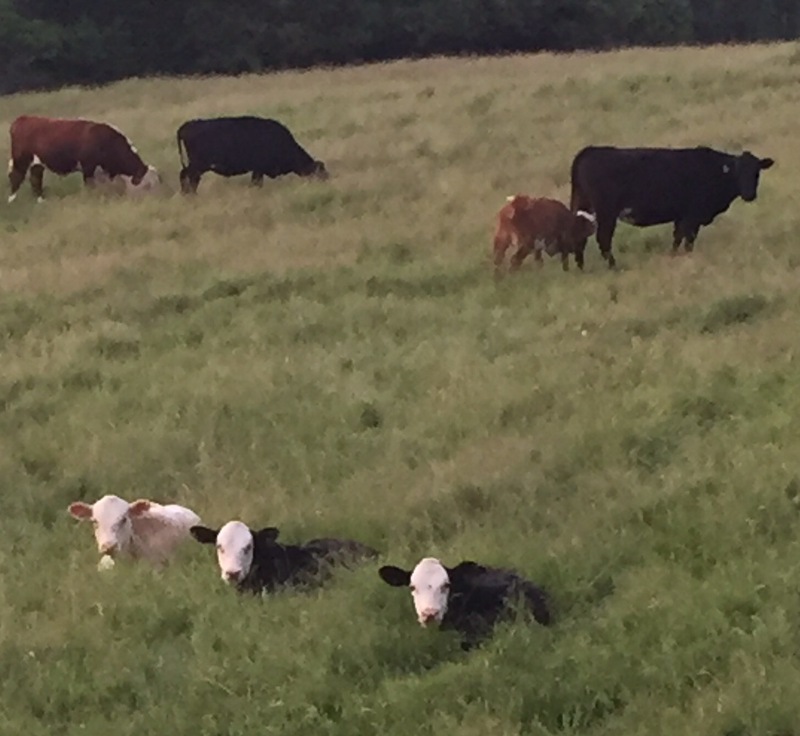 The shorter days make it tricky to get it all done at times. Well enough writing about it, off I go to tackle our (house) chore list. Blaine is working away at the farm to do list. There is ALWAYS something to do at the Funny Farm.